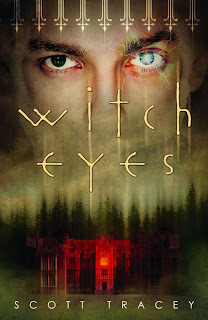 Today I am really pleased to welcome Scott Tracey, debut author of Witch Eyes onto the blog. Scott tells us about his journey to publication as well as answering all my questions about Witch Eyes. Witch Eyes has a big creep factor, did you intend it to be so creepy? I think the cover is creepier than the book actually is. But I wanted to tell a story that was a little more somber, a little more melancholy. I think the cover gives you a sense of atmosphere, that this isn't a happy smiley story of adversity. Do you enjoy reading books about witches? I ADORE books about witches - there's something so fascinating to me about the whole practice of magic and what you can/cannot do with it. It's especially interesting because in YA novels, teens who typically LACK power over their lives can find this substitute in magic. Suddenly, they can go from no power at all, to having all KINDS of power. I think it's a fun question to ask: what would you do if you could do anything? What is your favourite witch from either TV, film or book? Ugh, so many to choose from! I have to pick one of each. From a YA novel, Faye from The Secret Circle novels because I love a bad girl. Willow from Buffy, because who doesn't love Willow? Her growth through the course of the series, ups and downs, always sticks with me. And definitely Nancy from The Craft, because a damaged bad girl? Even more fun. Belle Dam sounds like an intriguing town, where did you get your inspiration for it? The inspiration for Belle Dam all came from the idea of the feud. If there's a town that's divided not just by political leanings (Democrats/Republicans, or Conservatives/Liberals) but by these two very polarizing individuals, how would the town exist around them? How do people divide themselves up? Are there "Lansing" places and "Thorpe" places? How do people carry themselves on a daily basis, do they acknowledge this feud, or do they pretend everything is perfect? These are the kinds of things I was thinking of when I started writing. One of the things I quickly realized was that, for the town to continue growing and to be stable, there had to be some sort of balancing act between the families. Otherwise, it would be one catastrophe after another. So I had to put a lot of thought into how Catherine and Jason dealt with each other, and in turn how that relationship would affect the town. What research did you carry out before writing the book? I did a LOT of research on the Pacific Northwest, specifically the coast of Washington. I looked at weather, climate, industry - all the things that I thought were important in laying the groundwork for this town. I wanted to have as much information as I could about how to try and make this town come to life. I also did a little bit of research into light sensitivity, or photo phobia, to try and figure out the kinds of experiences that Braden might have gone through; in addition, I looked into different cultures and their perception of the Second Sight, and what that entailed. I also might have walked around my apartment for a few days wearing sunglasses and consequently banging into things...all in the name of research, of course. I love that your main protagonist is gay, especially during the controversy over YA authors being told to ‘ungay’ their characters? Did you write him this way to challenge attitudes? I actually just wrote him that way because I wanted to read a traditional kind of urban fantasy with a gay protagonist. And at the time (Witch Eyes was originally written back in 2007), there weren't a lot of books like that available. So for me, it was never really about changing attitudes, it was just about writing a book that I would have wanted to read. Braden being gay was one of the first things I knew about the book, it was one of the main parts of the story I wanted to tell. In the first book, it was a toss-up between Braden himself, and Lucien. Or possibly Riley. Braden got some of my favorite lines, and both Lucien and Riley steal the scenes they're in. Actually, Riley was an unexpected addition to the book - she just popped up into this scene I was writing, spastic and nosy, and I kind of had to keep her around after that. It changes with each book, though. My favorites from the second book are two other characters (one who was in Witch Eyes, and one who doesn't show up until book 2). It's kind of a funny story. Leah (Clifford, author of A Touch Mortal) was working on a revision for her agent at my apartment at the time, since she couldn't concentrate at home. My phone rang, it was my agent, who I literally stopped after the words "We have an offer" so that I could put down the phone and tell Leah, "Ha! I win!" How did you keep yourself occupied as you waited for publication day? I worked on other things, trying to keep myself distracted. I wrote other books, I worked on other projects and started trying to build an online presence. There's always this sense of "it's not really real" until your book comes out, so that helped a lot. How did you celebrate on publication day? I spent a ridiculous amount of time online, haha. I had a bunch of different things planned for launch day, so I did a lot of those. I think we might have gone out to dinner, but I can't remember if that was on the release day, or just a day surrounding it. Overall, it was very low-key. I understand that Witch Eyes is the first in a series, what can you tell us about the next book? The second book, Demon Eyes, picks up just about a week or two after the end of Witch Eyes. A lot of it deals with the fallout with some of Braden's choices in the first book, and a new mystery that begins. A couple of new threats emerge, and new lines get drawn in the sand as Braden's friends start pulling away from him. I usually write in chunks of time. So if I wake up at 9, I'll start writing from 11-1, and then take a break for a few hours. Then write from 2-5, and then I'll watch TV and make dinner, all the normal things like that. Then another writing push from 11-1 or until I get bored and go to bed. Write a lot. Read a lot. Don't just read the genre you write in - embrace many different subjects and styles. Start learning the business and how it works almost from the moment you start writing. Follow agency blogs, editor blogs, writer blogs. Use social media to start networking - not only is it a good long-term skill, but it also can help you make friends who are at the same level you are (writing, editing, querying, etc). Thank you Scott for some fabulous answers. 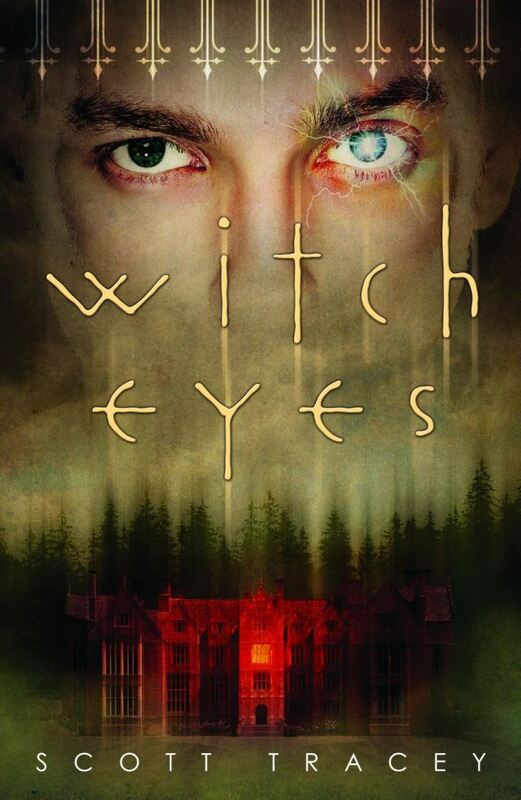 Witch Eyes is currently not published in the UK, but can be bought via The Book Depository and Amazon UK. As always, terrific BIG BREAK! This author is animated in your interview, and the book/series sounds fascinating. Suko - I can't wait to read the next book. Really good interview, I love those bad tv and film witches too. Great interview, I read this whilst I was in London and really enjoyed it, so it's nice to hear more from the author! I loved Riley too, she was my fave character.